There’s nothing like true sourdough and the way it offers up a rich and complex tartness that speaks of true, artisan-style old world breads. And if you’re an avid sourdough baker, you probably end up with extra bread. One of the best ways to make use of day-old sourdough bread is to cube it, toss it in broth, butter and herbs and make sourdough stuffing. 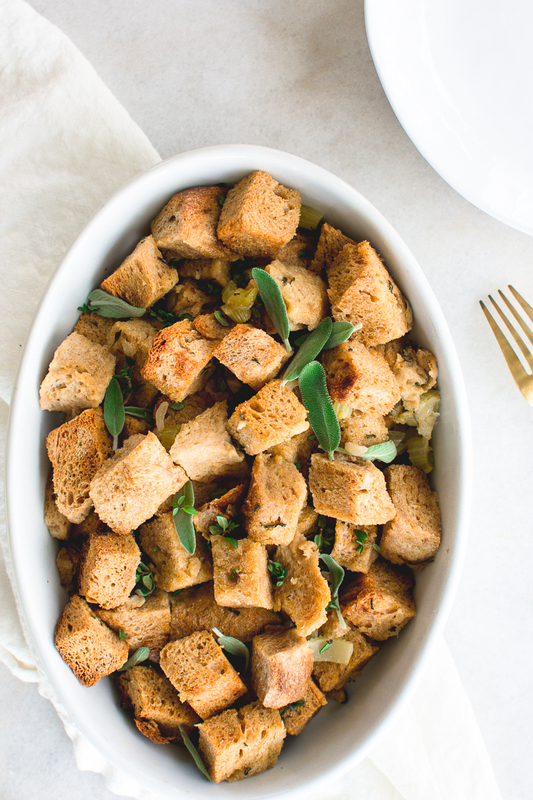 Like sourdough bread, sourdough stuffing has a richly complex acidity that balances beautifully well with fresh herbs, roasted meats and well-salted gravy. Stuffings made with bakers yeast lack that acidity, that complexity and the multi-leveled flavors that develop when you use real, artisan-style sourdough. A stuffing’s only as good as its bread. 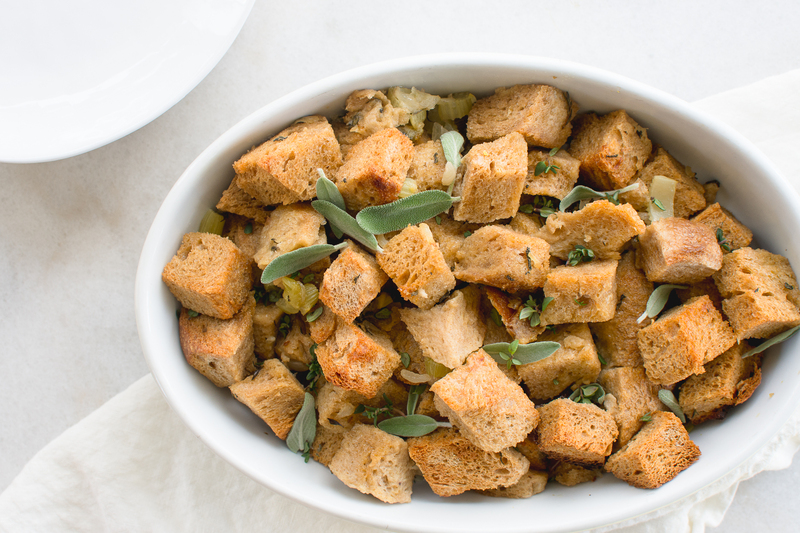 To make sourdough stuffing, you’ll need to start first with a large loaf or two of day-old bread. Because artisan-style sourdough breads tend to be crusty, you’ll want to trim away the crust to reveal the tender crumb, and then chop the remaining crustless bread into cubes – just perfect for a mouthful. 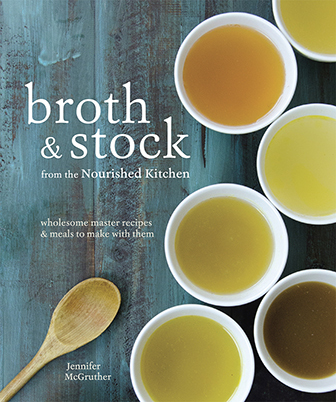 After toasting the cubed bread, you’ll mix it with eggs and chicken or turkey bone broth, sautéed onions and celery and fresh herbs before layering it in a baking dish. As the sourdough stuffing bakes, the cubed bread absorbs the broth and eggs forming a soft and tender, custard-like texture. The baking dish you use to baking your stuffing will influence your results; and if you like a stuffing that has crunchy bits of savory bread, a shallower dish that allows more surface area to be exposed will result in crisp top layer; however, if you prefer a sourdough stuffing that’s wonderfully soft, a deeper dish will minimize the surface area of the stuffing as it bakes – giving you a softer stuffing. Whole grain sourdough bread is baked in butter and broth with fragrant herbs to make an utterly delicious sourdough stuffing with just the right punch of acidity. Since this sourdough stuffing isn't cooked inside the bird, it is technically also a dressing. Heat the oven to 225F, and then line a rimmed baking sheet with parchment paper. Set your bread on a cutting board, and use a bread knife to carve away its crust. Discard or compost the crust. Now cube the bread into 1-inch pieces. Arrange the cubed bread on the baking sheet. Bake for 90 minutes, stirring half-way through, until crisp. Remove the tray from the oven and let it rest. Turn the oven up to 375 F.
Warm ¼ cup butter in a wide-skillet over medium heat. When it begins to froth, stir in the onions and celery, allowing them to cook in the hot butter until fragrant and translucent. Stir them occasionally as they cook to prevent them from browning. Dump the bread, onions, celery, and fresh herbs into a large mixing bowl. Whisk the broth, eggs, salt, and pepper together and then pour them over the toasted bread. Transfer everything to a 3-quart baking dish. Dot the top of the stuffing with the remaining butter, and then, cover the baking dish with parchment or aluminum foil and bake for 30 minutes. Uncover the stuffing, and continue baking a further 10 to 15 minutes or until golden brown on top. If you’re new to baking sourdough and don’t know where to start, this free resource will guide you through making a sourdough starter and your first loaf of artisan-style sourdough bread. If you’re already a passionate sourdough baker, you might like this recipe for sourdough pancakes as it helps you get rid of any spent starter. Sourdough stuffing has a bright acidity that pairs nicely with rich foods, like Roasted Turkey or Easy Roast Chicken. 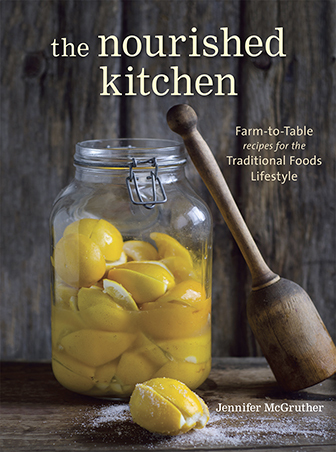 For more Thanksgiving ideas, download the Nourished Kitchen guide to Thanksgiving here. Maple Brined Turkey with Citrus and Herbs is a lovely match for sourdough stuffing, as it also uses rosemary, sage and thyme. A Golden Beet Gratin is a lovely addition to the table and pairs beautifully on the side with sourdough stuffing. Cider Cranberry Elderberry Sauce is a neat take on traditional cranberry sauce. Fennel Orange Salad is a super fresh and vibrant addition to the table.